McDonald's is now featuring "Fruit and Maple Oatmeal" and you can get it ALL day - not just for breakfast. I took a trip out to my local McD's to give it a try. 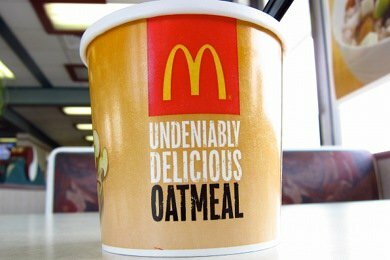 Is it undeniably delicious oatmeal? Since I wrote this post in 2011, I have been back – and there is a way to order McDonald’s oatmeal and save 29 grams of sugar – be sure to check out this post. Why do I go to McDonald's? Well, even though it is a mega-corporation that has some scary practices (and food), I believe it can be a force of good. McDonald's gives us what WE want. Maybe we want a tofu burger with a 100% whole grain bun. Maybe McDonald's will listen and give it to us. How do they make it? It is instant oatmeal with the sugar pre-added and then they add hot water, cranberry raisins, diced apples, and light cream. I watched the chef (AKA McD's manager) mix it up himself. It has a little fresh fruit. The calories are not out of control. This oatmeal has almost the same nutritional facts as my Apple Peanut Butter Oatmeal. Of course my oatmeal didn't have any sodium stearoyl lactylate (I was fresh out). It has a bunch of chemicals that you may deem to be unsavory. I was hungry about 2 hours after eating it. Should be called FRUIT and BROWN SUGAR oatmeal as there is no maple syrup (just maple flavoring). Also, it is a bit sweet. The downside of having it pre-made is that you can't adjust the sugar. My Apple Peanut Butter Oatmeal had 11 grams less sugar in it, but I actually add a little maple syrup to the recipe to make it work for me. I probably wouldn't eat this every day, and if I HAD to, I would bring some peanut butter to add some protein to the carbohydrates in this oatmeal. Then it would be closer to a healthy breakfast. As a snack, it is a bit large, but it is much better than many of the other food served there that I would say go for it. If you don't add the Cranberry Raisin blend you can bring it down to 220 calories, which is pretty close to a reasonable snack. Check out my comparison between Starbucks and McDonald’s oatmeal if you love to eat your oatmeal at either spot. What do you think of McDonald's new oatmeal? I too tried their oatmeal on the way home from a road trip last weekend. We wanted a hot breakfast and didn't have any other options in the car besides other fast food places. I thought it was good, and you can apparently order it without the brown sugar. I think it's a good "fast food" option if you HAVE to eat fast food breakfast. Of course, I'd prefer to make it at home, but that's not always available. Thank you for this post. I may stick to Starbucks oatmeal...you control the sweetness. :) :) Good alternative to an Egg McMuffin though if you're on the road...glad they came out with it. Hopefully it survives. I had no idea Starbucks served oatmeal! Guess I have to get out from under my rock more often. I will go take a look. Thanks for the suggestion! I ordered it while on a road trip during the northeast blizzard and welcomed something with less fat from MickyD's. Not bad, but too sweet for me. I like the idea of adding some PB. 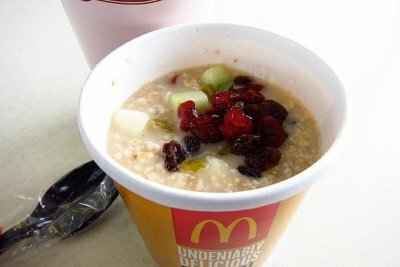 I don't frequent McDonald's very often, but am so happy to hear they are serving oatmeal and healthier choices. I haven't tried it but I have been adding chopped organic Fuji's and cinnamon to my organic low sugar oatmeal and it is delicious! Being too sweet, is the biggest complaint I have heard from people on this. Since the biggest complaint is the sweetness, you can order it without the brown sugar and it takes away 30 calories. Starbucks oatmeal is Quaker instant oats. what about the egg mcmuffin? Has 20 more calories but much more protein and actually is satisfying. I ate a similar sandwich for breakfast every day when I was living in a dorm last year (at the age of 43) and actually lost weight over the year. At least the egg mcmuffin stays with you until lunch time. I agree with Cassie, you can ask for it without the brown sugar and it drops the calories down. Also, at least for me, I never miss the extra sugar. The apples and raisins provide enough sweetness. I also agree with Snack Girl- sometimes you have absolutely no choice but to eat out for whatever reason. This is a healthy, lower calorie, meal alternative if you pair it with like a black coffee. Another option for those of you that get caught out occasionally and need to grab something healthy without getting your sleeping toddlers out of a car, you can also get the 'protein plate' at most Starbucks. It has some cheese, some grapes, a couple apple pieces, a hard boiled egg, and a multi-grain little bread slice. If you do not eat the peanut butter/honey spread packet (80 calories) it drops it down to 290. I think the bread is just fine by itself. I appreciate that places are attempting to offer more items that are healthier and list the calorie counts right on their boards. My local 7 eleven has started selling individual bananas right near the check out. Love that. Pair that with a black coffee and you are good to go. I often stop in mid walk. I'm pleased to see some acceptable occasional options for busy people on the run. I hope to see more healtheir options than the typical junk. Thanks for sharing this infor Snack Girl. I really like the Jamba Juice oatmeal. It is whole grain, and you can control the toppings (I get mine with a fruit topping and no brown sugar. I am enjoying it on the days when I either don't have anything to take along, or don't have time. Much better for me than a sausage McMuffin, which is what I would have gotten in the past. They offer this dish without sugar at my local McD's, which is only 260 calories. Not bad for an entire meal! That's the only way I've had it and it is pretty darn good; super-sweet, wihtout the added sugar! I can only imagine what it tastes like with the sugar... McD's is practically outside my office door. Thankfully, I have a lot of self-control when it comes to fast-food. But, this b-fast is my go-to if I run out of time in the morning. Thanks for posting this kind of information. I love making your snacks at home, but it's good to know I have a few options when out of the house with my 2 year old!